The English name, Knocknagussy, appears to be an anglicisation of a different Irish name from the one recorded by Tim Robinson on his map of Connemara: Binn Dhubh. Knocknagussy suggests Cnoc na Giúise, 'hill of the pine tree', or Cnoc na Giúsaí, giúsach being a collective noun. In Connemara it can refer to pine found in the bog or bog-deal (giús portaigh) [Dinneen]. Knocknagussy is the 710th highest place in Ireland. Knocknagussy is the most southerly summit in the Partry/Joyce Country area. 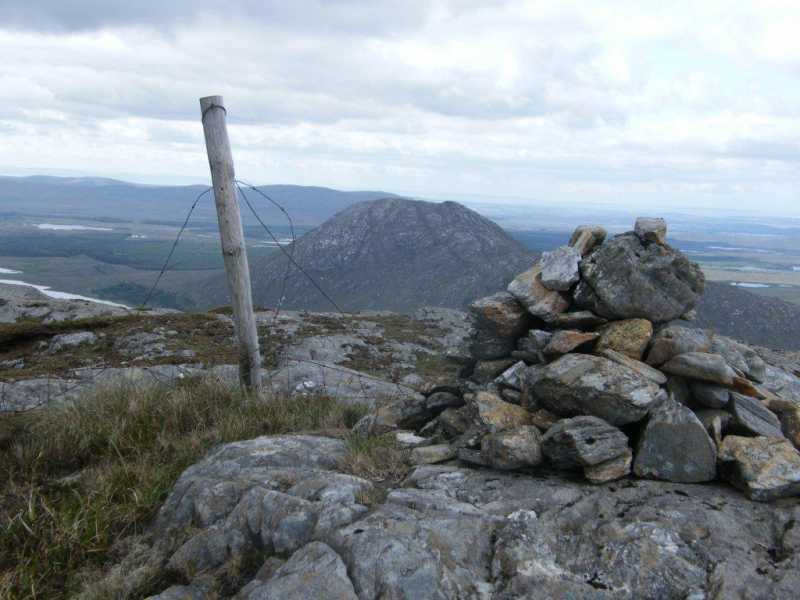 Picture from paddyhillsbagger : Knocknagussy cairn with Lackavrea behind. Picture: Knocknagussy cairn with Lackavrea behind.